Around 20,000 Russian fans will be visiting Brazil for the mega tournament. According to the Russian Consul General in Rio de Janeiro, only 500 of them are classified as violent fans. In total, about 20,000 Russians will be attending the World Cup, which kicks off in Brazil on June 12, according to Russian Consul General in Rio de Janeiro Andrei Budayev. Budayev was keen to stress that a very small number of these were likely to be potential troublemakers. “Only 500 people are estimated to belong to the so-called hyperactive fan category or, to put it another way, will possibly require extra attention from the consular service and law enforcement,” he said. “The crime situation in Rio de Janeiro has traditionally been very complex and, in spite of additional measures taken by the Brazilian government, is unlikely to change dramatically during the World Cup,” the diplomat warned. He added that a number of Russian law enforcement employees is to be sent to Brazil during the 2014 World Cup, “which we hope will contribute to the security of Russia’s presence and participation in the competition,” he noted. “The Russian Consulate General in Rio de Janeiro, together with our colleagues from the Russian embassy in Brazil and the Consulate General in Sao Paulo, have been operating in a state of high alert in order to support and ensure Russia’s participation in the World Cup,” he said. 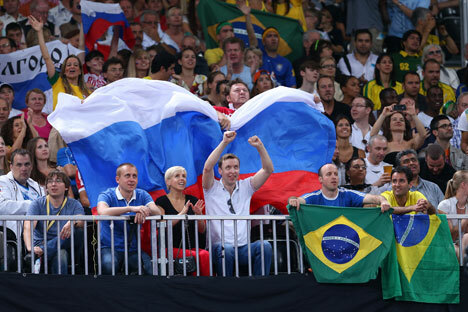 He also noted that the website for the Russian Consulate General in Rio de Janeiro has a special section called "Important and useful information for Russian citizens, tourists, fans, and media representatives at the World Cup.” The section provides general information about Brazil and cities that are participating in the event, as well as specific recommendations regarding safety and rules of conduct during a trip to the South American country.